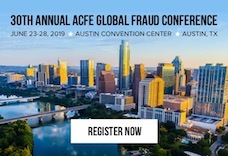 John F. Sopko, the Special Inspector General for Afghanistan Reconstruction (SIGAR), shared some of these challenges with attendees at the 2019 ACFE Fraud Conference Middle East. In July 2012 Sopko was sworn in after being appointed to the post by President Obama, and SIGAR oversees the $132 billion reconstruction effort in Afghanistan. “Think of [SIGAR] as the supreme audit authority with guns,” Sopko said. While SIGAR investigates fraud in the same fundamental ways that fraud examiners do, it faces a number of unique challenges. More than 20 terrorist groups are present in Afghanistan and Afghanistan ranks 177 out of 180 countries on Transparency International’s Corruption Perception Index. SIGAR’s agents travel with sizable security details anywhere they go in the country, which makes gathering evidence in fraud cases, or meeting with whistleblowers difficult. “In most of the world, you can simply get on a plane … and knock on someone’s door to conduct an interview,” said Sopko. “Due to the security situation in Afghanistan, we are not able to do so.” To travel from Kabul International Airport to the U.S. Embassy, a journey of three kilometers total, Americans must fly, as the roads have been deemed too dangerous. “Our challenge has been finding ways to maintain our presence in Afghanistan, even if our agents can’t get outside the U.S. embassy,” said Sopko. One way they’ve been able to do that is through their active fraud hotline. “We have advertised the hotline heavily on our Facebook page, on our website, on billboards,” he explained. They also have bought advertisements on airline magazines that fly into Kabul, and they share information about the hotline at American Afghani diaspora events. Sopko explained that many Afghans are tired of seeing their country and fellow citizens taken advantage of by opportunists and are eager to report fraud knowing that SIGAR will take their tips seriously and investigate. He shared a couple cases that SIGAR investigated, including a fuel bid-rigging and price-fixing scheme that would have cost the U.S. government $250 million, along with some schemes run by American servicemen while stationed there. The fraud schemes involving U.S. servicemembers are examples of understanding the unique situation that Afghanistan presents. While soldiers transferring large amounts of cash back home might not raise red flags in other areas, Afghanistan is largely a cashless environment for servicemembers, so it’s considered suspicious behavior. Sopko closed his session on a sobering note that reminded attendees about the heavy cost of fraud in combat zones. “Fraud is about more than dollars and cents. It can be about winning and losing wars and it can be about living and dying,” he said. He explained one case where a contractor was brought in to build culvert denial systems. Culverts are holes under roads to help prevent flooding, but they also can be easy areas for terrorists to plant improvised explosive devices (IEDs). As such, they need to have grates or other blocking methods built to cover them so no IEDs can be placed there. Even though many anti-fraud professionals will never need to investigate in a challenging area like a combat zone, there are still important lessons to be learned from these experiences.